Kids eagerly wait for weekends as they look forward to enjoy the activities planned for them. One being "Family movie night" scheduled by dear hubby. Post dinner we sit down to watch a kid friendly movie which helps them to relax and enjoy after studies and other school activities. Personally, I see this activity as an opportunity to enhance our family bonding. Now the activity I m interested in is baking! Hubby takes care to engage kids in extra curricular activities and, I prefer to enter the kitchen to start my baking with a relaxed mind and extra time on hands. This is usually done on a day before the Family movie night:). Baking kind of unwinds me from my daily mechanical routine and I am sure it has the same effect on all of you who love doing it. Being alone in the kitchen with my baking equipments, I am able to enjoy the whole process, right from assembling, mixing the ingredients to preparing the final product. Today, I am posting a recipe of chocolate cake that I finished baking last weekend. This recipe is eggless bookmarked from Joy of Baking. Reading through it, I got to know that the cake was named as "Wacky" or a "Crazy" Cake. 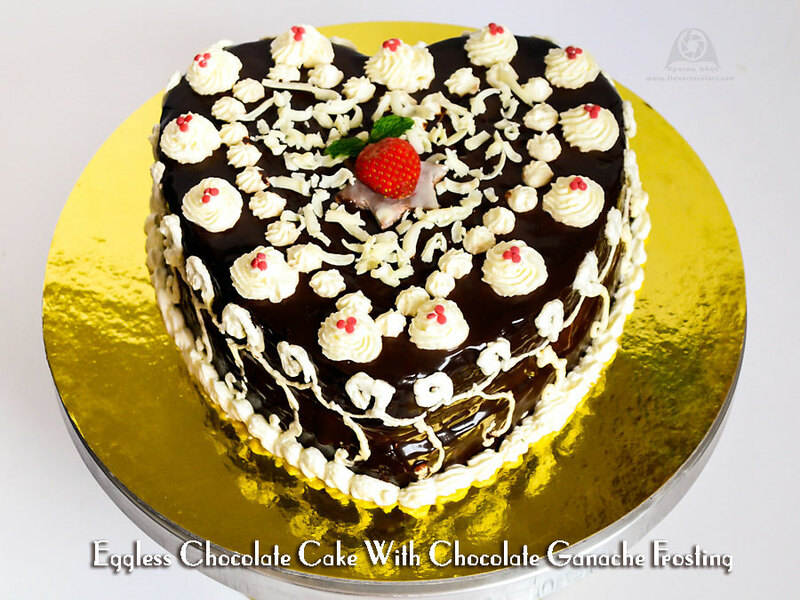 So if you are crazy about chocolates this cake is perfect for you ! 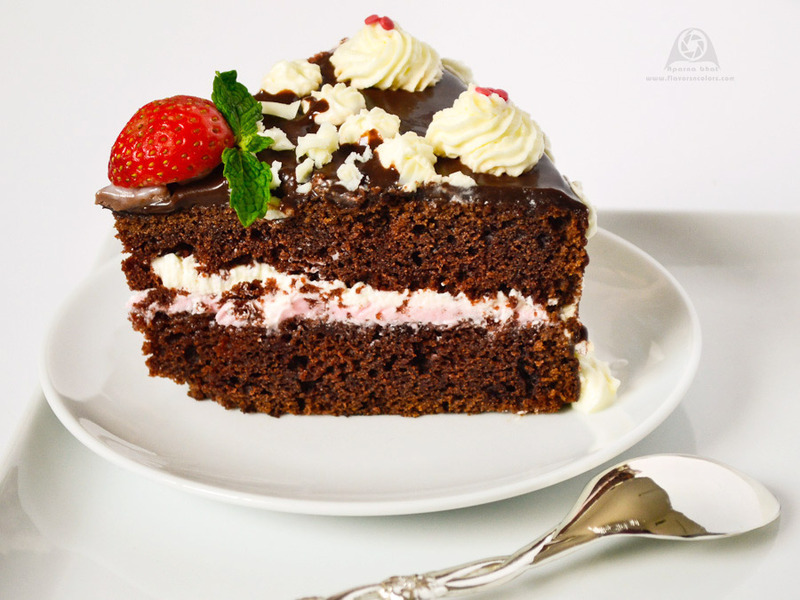 This cake was soft, moist and filled with super rich chocolaty flavors. I sliced the cake into two layers and sandwiched it with strawberry buttercream filling [you can use chocolate buttercream or the whipped cream itself to fill in between the layers] and finally frosting done with chocolate ganache. All chocolate lovers out there, do try the below recipe to find a little piece of heaven in every slice ! Preheat the oven at 180 degrees C for 10 minutes. Grease a pan [I used Wilton heart shaped] with butter and line the base with butter/ baking paper. Heat water and sugar in a saucepan and set to a boil. Once sugar melts completely, switch off the flame and allow it to cool. Mix the chocolate chips, cream and butter in a heat proof bowl. Place this bowl over a saucepan of simmering water and allow the chips to melt down slowly [Double boiler]. Blend the ingredients well to get a smooth sauce. Switch off the flame and allow it to cool. Place the cooled chocolate cake on a cake board and using serrated knife [ or whichever technique you are comfortable] slice the cake into two layers. Lift the top layer and keep it aside. Put some sugar syrup on the cake layer that is placed on the cake board. Spread buttercream [I used store bought] all over the soaked cake covering it completely. Carefully place the other layer over the buttercream and take care to align it with lower layer. Moisten it with remaining sugar syrup. Allow this to rest in the fridge for 10-15 minutes before you proceed with frosting. I used the heart pan once again while using chocolate ganache to frost the cake. Place the heart pan upside down inside a steel plate* and place the cake over this pan to continue working with ganache. Brush out any loose crumbs. Spread a very thin layer of ganache " crumb coat" with spatula to seal in the crumbs on top and sides. Ensure the cake is covered with ganache from all sides and keep this in the fridge for 15-20 mins. Once the crumb coat has set, take it out and use a spatula to level it smoothly. Pour the remaining chocolate ganache over the cake letting it drip over the sides. You can see in the above pic how the excess dripping ganache was collected in the steel plate*. Smooth out the sides with a spatula. Let it stand until the frosting gets set/hardened. Decorate as per your choice. I used whipped cream to pipe some rosettes at the border, sprinklers, chocolate shavings, strawberry and mint leaf to decorate the cake. Delicious chocolate cake is ready. Slice cut and relish ! 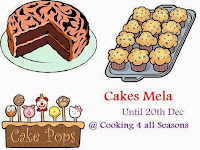 Me too frm bangalore .. happy to find a blogger frm my place..
wow this cake is making me drool here..
Thnks Smitha,,,glad to know u too from Blore !